Pupusas are a way of life in California. When you’re driving down the street you can find them almost anywhere on each block. They go well with breakfast, lunch, and dinner and make the perfect late-night snack as well. Most people in Florida don’t know what a pupusa is and giggle when they hear “poo” in its name. This weekend I took two friends to perhaps the only pupuseria in Tampa called Pupuseria CentroAmericana. Located on Martin Luther King Jr. Blvd, the restaurant certainly fits a hole-in-the-wall look, but then those places are usually the best places to get something to eat. Upon entering the blue and white building we found a booth right near the entrance and had a seat. A server came out and brought us our menus. They took our order for drinks as I explained the different items on the menu to my friends. Friend #1 ordered a horchata (rice-water cinnamon drink that I introduced to her at the Taco Bus) and Friend #2 had a Coca-Cola (they come by the bottle…but honestly I don’t think it would go well with the food there). They also have different fruit juices available, but we didn’t try any. I stuck with a water because I’m trying to save money at the moment. It took us some time to decide what we wanted to eat, but the waitress was patient with us. 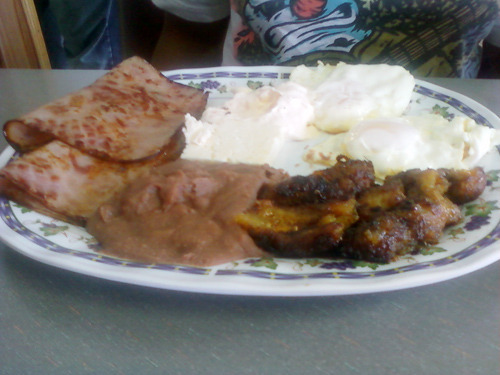 Friend #1 decided to have their Ham Special ($7.50), which comes with a type of hard cheese (called Queso Fresco), sour cream, refried beans, fried plantains, two eggs, and tortillas. Friend #2 ordered the Steak breakfast combo #40 ($7.50), which comes with everything that is in the Ham Special (minus the ham). 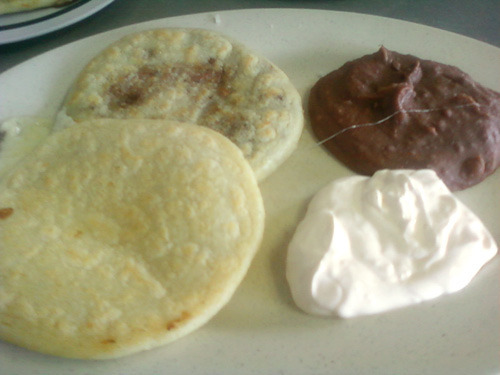 They also both ordered a pupusa ($2.00 each) with refried beans and cheese mixed together. I ordered two pupusas ($2.00 each), one with cheese and one with refried beans mixed with cheese. In addition, I ordered a side of sour cream ($1.00) and refried beans ($1.75) so my total would only come to $6.75. Quite a deal! Both their breakfast orders came out before the pupusas and were making my mouth water! Friend #2 noted that his steak had some good seasoning on it, I was suspecting it was maybe Carne Asada…but I wasn’t sure, I will try it for myself sometime in the future. Before I knew it the pupusas came out and they looked delicious! Nice and big, not too greasy. The pupusas were excellent; I couldn’t tell the difference between these and those in California. I attacked those pupusas with all my hunger, but just like those in California they were heavy and made me full fast. The cheese was excellent and the mixed pupusa was fantastic, the refried beans were certainly homemade and not the canned kind you find in many Florida Mexican restaurants these days. I was glad I didn’t order extra food. My friends could barely finish their food, but I’m glad they ordered regular breakfast as well so they could play it safe in case they didn’t like pupusas. Previous Post Poll: Best Boba Slushie? Glad to count among your readers Carlos! Your writings give me the taste of discovering more about this fascinating Latino cuisine. Lately, I have been enjoying the works of a great Latino Chef here in Montreal: Mario of Restaurant Raza. 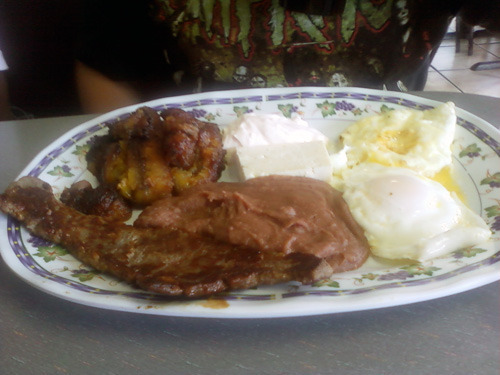 He is into upscale fine dining, but I do also enjoy a lot of the more traditional Latino food. We have here in Montreal, few restaurants called pupuserias with great food. Sounds fantastic! Thanks for the comment, I’m currently browsing your Xanga. Who knew we were already friends on there! Wow. This is a small world. Hopefully one day I can visit all those great restaurants you are reporting about. I’ve bookmarked your blog: really like what you write.